The Holy Moonlight Sword is a tremendously powerful weapon. It requires 16 strength, 12 skill and 14 arcane of its wielder. This weapon has comparatively lower base physical damage than Ludwig's Holy Blade and the Kirkhammer, but trumps both in overall damage by having the highest base arcane attack of any weapon in the game! Speaking of arcane, its transform mode can launch arcane waves outward, so it also doubles as a ranged weapon. In addition, it receives a good increase of scaling damage with high arcane levels combined with a 50% damage bonus against enemies weak to righteous weapons which is present in both modes. In conjunction with its arcane damage, The Holy Moonlight Sword has very few physical or thrust attacks; its primary focus is instead on blunt damage. Without a doubt, this is an absolutely amazing weapon for strength and arcane specialized hunters. 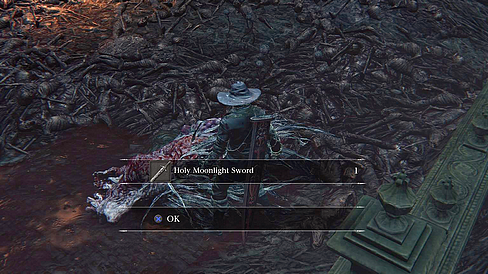 Normal Mode: The Holy Moonlight Sword's normal mode uses a moveset typical of a greatsword. Many of its attacks swing in wide horizontal arcs making it a good tool for crowd control. A large portion of attacks in this mode are blunt, though it also contains this weapon's only two thrust attacks, which are strong and very useful. What this mode lacks in its presentation, it makes up for in practical ability. Transformed Mode: While this mode retains the overall range and physical damage of the normal mode, its arcane damage is what makes it shine. Most attacks receive roughly a 40% increase in arcane damage. R2 attacks can send out projectile waves of arcane, with each costing a single bullet to use. Once you've run dry of bullets it will function as a normal greatsword, and the arcane multiplier will lessen. Stamina usage in this mode rivals that of the Kirkhammer, so you'll need to be careful to not run out while fighting. 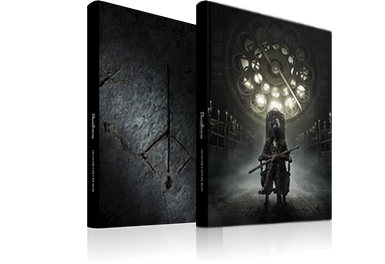 Normal: Treasure in Hunter's Nightmare, Underground Corpse Pile, interact with Ludwig's head while wearing Black Church Garb, White Church Garb, Choir Garb, Executioner Garb, Tomb Prospector Garb or Gascoigne's Garb or kill his head for the sword. Fire Paper and other buff items won't work on the Holy Moonlight Sword, so equipping it with an elemental gem to convert its damage is entirely pointless. Instead, you'll want to increase both of its inherent damage types. For this purpose, the use of Nourishing gems will benefit you greatly. Though these won't increase your arcane damage, Adept (blunt) gems can be useful as this weapon's moveset is comprised of mainly blunt attacks. On that note, you may instead want to increase the damage of the few thrust attacks this weapon has for more versatility. Even players with high endurance may still want to offset the high stamina costs of the transform mode's attacks with Radiant Gems. This may take up valuable slot space, but will afford more aggressive players the stamina needed to maneuver as necessary. For more information check the Best Blood Gem Setups page. Normal Mode: The Holy Moonlight Sword's normal R1 chain, rolling R1 and quickstep R1s are useful for managing crowds. Their use is heavily limited in cramped or narrow spaces, however, since the swings tend to rebound off walls and objects. The R1 chain is a series of back and forth swings. Though quite basic, this is exactly what makes them so effective, as the broad strokes will not miss too easily. The normal R2 is one of the best attacks available in this mode. It's a thrust attack, which is useful against enemies weak to this damage type, but where it really shines is in its speed. When used repeatedly, this attack is only somewhat slower than the R1 chain, but will easily stumble most normal enemies with each strike. The main downside is that it consumes large amounts of stamina when used this way; however, this will usually kill the average enemy before it can react. The dashing R2 is another strong attack with heavy impact. It has good forward momentum and a solid damage multiplier, making it good for hit-and-run tactics. The charged R2 is this weapon's only other thrusting attack. When it connects with an enemy's rear, it can cause them to stagger. This attack steps forward while using the full extent of the blade. Much like with the Rifle Spear, this can make sneak attacks much easier to execute, since you'll be less likely to gain their attention by getting too close. When you've staggered an enemy, you can follow through with a rear visceral attack or the follow-up R2. In combination with the initial charged R2, the follow-up will almost always break an enemy's super armor, inflicting massive damage and impact. Transformed Mode: The first two attacks of the R1 chain strike in a vertical manner. The first is an overhead, yet it lacks the range to strike most enemy weak points. Any attacks past these first two will swing horizontally, which is useful against groups or enemies that approach you mid-combo. Though this requires more stamina, the dashing R1's multiplier is higher than the peak point of the R1 chain. This can be handy against enemies with higher values of super armor that require a single hit approach. Aside from when plunging, each of the R2 attacks in this mode will launch an arcane wave a good distance ahead. These projectiles will deal decent damage by themselves if you plan to use them for ranged combat. However, these attacks are especially devastating in combination with the blade at close range. That being the case, if you have at least two bullets and stagger an enemy from behind with a charged R2, instead of using a rear visceral attack, you can use the follow-up R2 for even greater damage and massive impact. The L2 is one of the Holy Moonlight Sword's best attacks. It can launch even the larger foes far backward with massive impact, regardless of whether or not it has broken their super armor. This is especially useful against closely grouped enemies or for knocking opponents off cliffs and ledges. Be warned however, that the use of this move requires a significant amount of stamina and a single bullet. As a general rule, untransformed attacks deal 50% of the the weapon's listed arcane damage after attack multipliers, while transformed attacks deal 70%. Exceptions are the L1s, L2, and Lightwave attacks. The Lightwaves themselves have their own multipliers. The blade during a Lightwave attack deals no Arcane damage, and only the Lightwave itself will deal Arcane damage. Once you run out of bullets, Lightwave attacks will deal 70% Arcane damage like the rest of the transformed attacks. Durability of the weapon depletes when used. This means hitting an enemy, destructible object or bouncing off the walls. Hitting undestructible objects and environment does not deplete your durability. Style of an attack or upgrade of the weapon, even different weapon, does not matter - each count as one hit. Every 10th hit against the enemy/object depletes 1 durability. Exception is Tonitrus, which when in self buffed mode, depletes durability at rate of 2 hits. Hitting an enemy in dying animation still counts as hit. Also hitting multiple enemies/destructible objects at once counts as one hit per enemy - hitting 3 enemies at once counts as 3 hits towards durability counter. Shields lose 1 durability every 10th hit. Bounce means when your hit is bounced back off the wall or other objects. Every 5th bounce depletes 1 durability. Not every weapon can be bounced off, Holy Moonlight Sword belongs into the category which can. Damage reduction when heavily worn. When weapon is at 30% of total durability, it reaches the Risk state and AR is reduced by 30% and when it hits 0% of total durability, weapon is Broken, then AR is reduced by 50%. Holy Moonlight Sword which has 250 points of durability reaches risk state at 75 Dur. Workshop's Repair: cost of repair depends on the weapon and its upgrade. 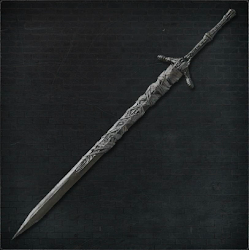 For Holy Moonlight Sword +0 it's 3 Blood Echoes per 1 point and for Holy Moonlight Sword +10 it's 10 (values are rounded), full repair costs for +10 are 2400 Blood Echoes.